Smart Growth Challenge: What is the best way to begin the revitalization of a disused industrial area around a significant transit asset? While the Town of Harrison was once home to a variety of manufacturers, mainly of metal products and chemicals, the land on which much of that activity took place is now largely vacant – and, in some places, contaminated. 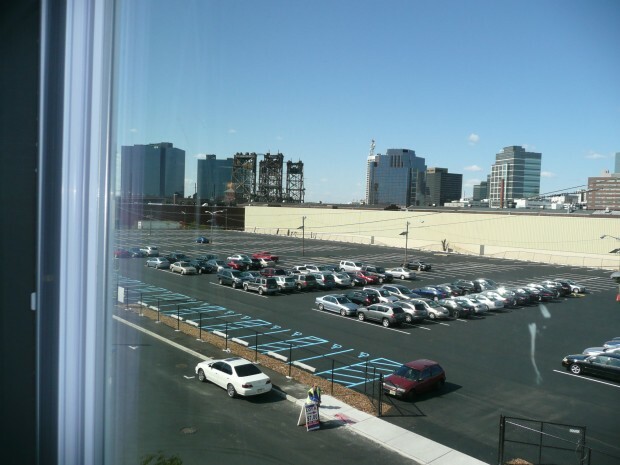 A redevelopment plan approved in 2003 allowed the town to re-zone the waterfront along the Passaic River, which separates Harrison from Newark, from the older industrial uses to a mix of uses, and required the environmental remediation necessary to develop it. 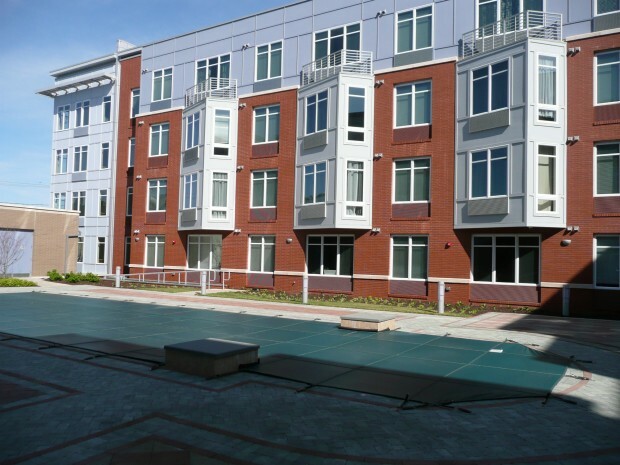 Harrison Commons, a 275-unit residential rental building with 15,000 square feet of ground-floor retail is the first project to be built under the redevelopment plan. 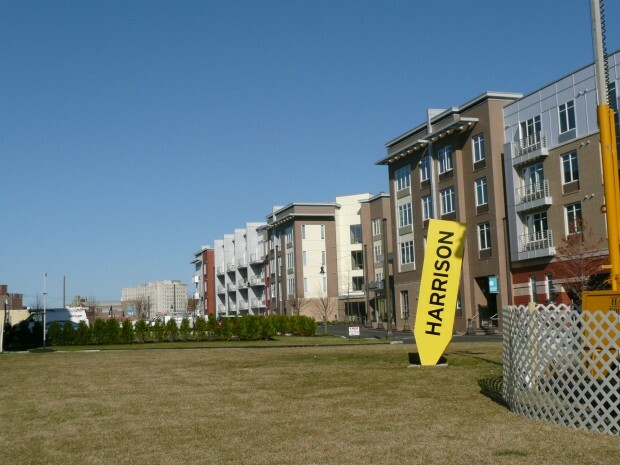 Currently surrounded by vacant land and abandoned industrial buildings, Harrison Commons is intended to serve as the catalyst for planned further revitalization in the area. This first building is constructed of variously colored brick, cement and metal in an edgy nod to the site’s industrial past; its appliances and fixtures are all Energy Star-compliant; and many interior finishes are made, at least in part, of recycled materials. Outside is a landscaped courtyard that will serve as a community gathering space, and an entirely new network of streets and walkways that improve connectivity. 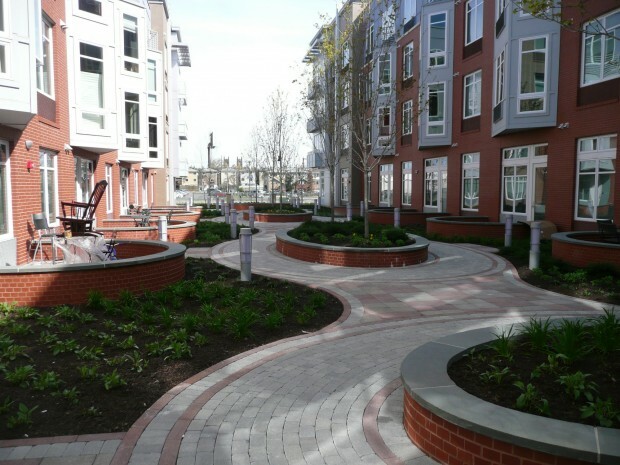 Streetscape amenities include trees, decorative brickwork and lighting. Planned retail tenants include a restaurant and a market, enabling residents to do some of their shopping without needing to drive. One block away is the Harrison PATH station, the anchor for the redevelopment of the entire area. The station is scheduled for a significant upgrade in honor of its centennial, including connecting pedestrian walkways and a steel and glass-covered pavilion for waiting passengers. These improvements will further enhance the desirability of the location. A short PATH ride away, across the river and visible from Harrison Commons, is the Newark waterfront, undergoing a renaissance of its own. 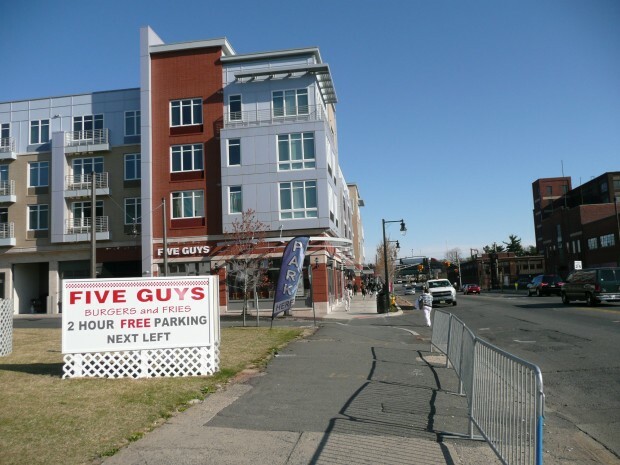 The 25,000-seat New York Red Bulls soccer stadium is also within walking distance, and there is structured parking for both residents and commuters. Coming in the future are more residential/retail buildings, an extended-stay hotel and a retail concourse. When the entire plan is completed, the area will have 2,600 new residences, 80,000 square feet of retail and 140 hotel rooms. 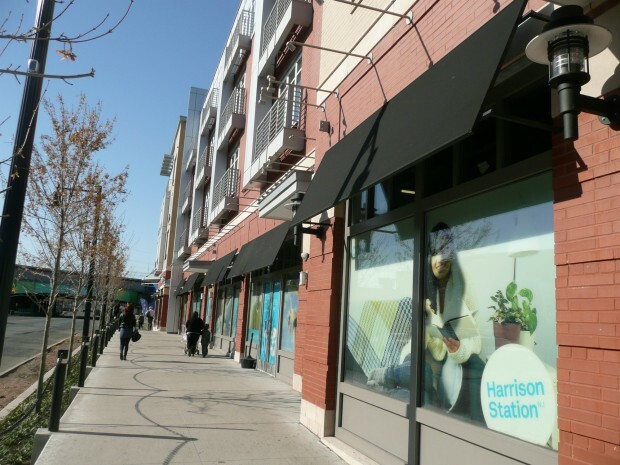 Harrison Commons phase I, currently fully leased, stands as a strong initial signal that the area is ready to be reclaimed from its industrial past and transformed into a vibrant, walkable, transit-accessible neighborhood. Supporting Partners: AJD Construction, Birdsall Services Group, Escobar Designs, The Marketing Directors, Melillo & Bauer Associates, Mulhern & Kulp, RW Sullivan and Torti Gallas and Partners, Inc.